AlNiCo magnetic material is an alloy of Aluminum-Nickel-Cobalt which possesses an excellent temperature stability and high residual induction. 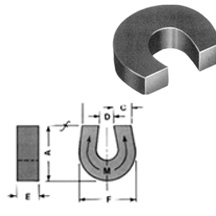 AlNiCo magnets have a low Coercive Force that limits their applications in many cases. Casting and sintering are two major processes used to manufacture the AlNiCo magnets. Dimension: A:1 9/16"; B:1 1/4"; C:7/16"; D:3/8"; E:7/16"; F:1 1/2"
Dimension: A:1 1/4"; B:1 1/4"; C:7/16"; D:3/8"; E:7/16"; F:1 1/2"
Dimension: A:1 7/32"; B:3/4"; C:3/16"; D:3/8"; E:1/4"; F:1 1/4"
Dimension: A:3.437"; B:2.750"; C:1.000"; D:0.750"; E:3.000"; F:4.000"
Dimension: A:4.125"; B:4.000"; C:1.250"; D:1.500"; E:1.250"; F:5.000"
Dimension: A:3.312"; B:3.250"; C:1.000"; D:1.250"; E:1.000"; F:4.000"
Dimension: A:2.500"; B:2.500"; C:0.750"; D:1.000"; E:0.750"; F:3.000"
Dimension: A:1.437"; B:2.375"; C:0.750"; D:0.875"; E:0.937"; F:2.375"
Dimension: A:1.594"; B:1.031"; C:0.375"; D:0.218"; E:1.031"; F:1.625"
Dimension: A:1 7/8"; B:1 7/8"; C:5/8"; D:5/8"; E:0.675"; F:1 7/8"
Dimension: A:1 3/8"; B:2"; C:5/8"; D:3/4"; E:3/5"; F:2"